Summer is near. Are you ready to strut those fashionable flip flops? 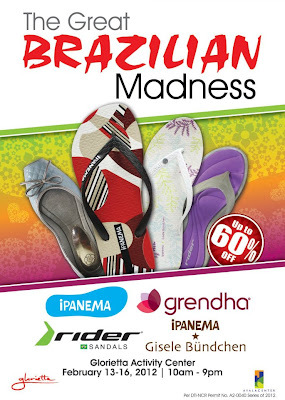 If not, head on at the Glorietta Activity Center starting today up to Feb 16, 2012 from 10am to 9pm, for The Great Brazilian Madness. Be first to avail of the Buy 1 take 1 Promo and up to 60% discount on Brazilian footwear brands, Ipanema, Grendha, Rider and Ipanema Giselle Bundchen! Hurry! Limited Collection only.